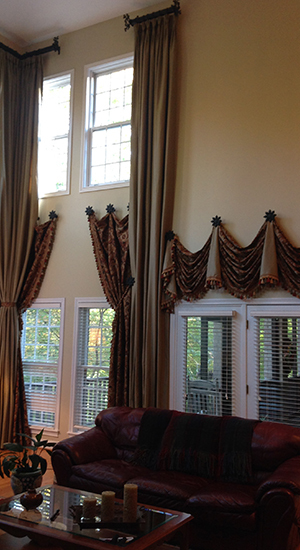 Here is a great room custom window treatments design which we recently finished. 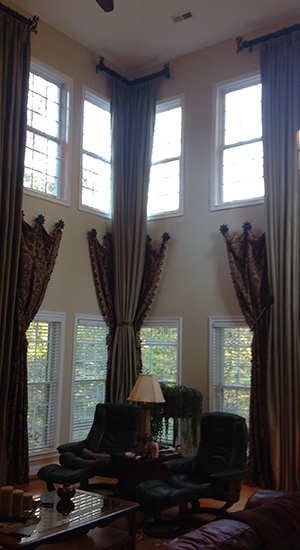 This was a huge project because of the height of the draperies which was 19 1/2 feet tall. All the drapery hardware is solid black wrought iron in order for it to have girth, for it to be in proportion, and for it to be sturdy enough to take all the weight of our lines and interlined custom draperies. Diane, who did the design for this window treatment, pulled all the colors for the fabrics out of the rug. The large panels are in an olive green, and she used a very beautiful decorative black red gold and beige print for the lower draperies. Fabricating the draperies in our own custom window treatment workroom was a challenge, however it was also fun to be making such large draperies and to be working with so much fabric.One of the main stipulations for this window treatment was to make sure, that we are not blocking the view and that the majority of the fabric will be covering only the wall. It was also amazing to see how the draperies transformed this great room design, not only did they give it so much more warmth, it also helped with the sound tremendously which was one of the problems they’ve been, especially when watching TV. The drapery installation took just about a day, a big majority of it was ironing all the draperies before they were hung.